We have Museum quality replica tomahawks for collecting, props, display, decoration and ceremonial peace pipe tomahawks. 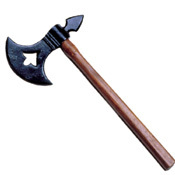 The metal and wood quality is very good on the realistic tomahawk replicas. 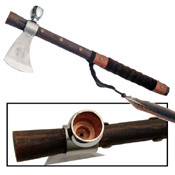 Deluxe Indian Peace Pipe Tomahawk: This reproduction's features include 15" wood handle, 9" solid brass hatchet with classic engraved Indian designs. Weight 2.5 Decorator model Tomahawk.